The 2014 Volkswagen Tiguan is an advanced crossover that drives more like a sporty car than an SUV. Aiming for luxury, the cabin is extremely well-apportioned and pleasing to the eye. Volkswagen’s emphasis on safety is clear. This crossover has many crash-optimizing features in addition to the regular raft of seatbelts and airbags. If you are looking for a crossover that is actually fun to drive, this is definitely worth a test drive. The 2014 Volkswagen Tiguan is a fun SUV to drive. It has a 2L Turbo engine that cranks out 200 horsepower and wheel-turning 207 lb-ft of torque. This powertrain delivers versatile torque, letting drivers enjoy expressive handling on curves and in highway sprints. Normally an SUV suspension doesn’t deserve a mention, but the 2014 Volkswagen Tiguan’s system is unique. In what Volkswagen calls 4-corner independent suspension, each wheel acts freely or in tandem as needed for road conditions. This flexibility improves handling while it gives passengers a smoother ride. It should reduce the natural damage to the undercarriage and the engine that happens over time. The 2014 Volkswagen Tiguan is in the minority. It is rare for an SUV, even a crossover, to offer a manual transmission. Fortunately, this manual is an asset to the drive. Those who love control will feel right at home with Volkswagen’s advanced manual capability. The DSG transmission, a seven speed automatic, also advances the handling. For one thing, it has one more gear than the typical 6-speed. For another, it uses dynamic shift electronics which make the gear changes crisper. It also features Tiptonic, the clutchless manual, for more driving fun. The Sport mode offers more acceleration when you need it for steep inclines or just want a racier performance. 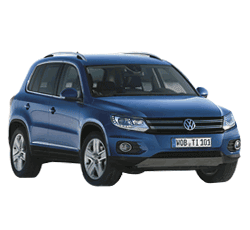 For four wheel drive, 2014 Volkswagen Tiguan offers 4Motion. Like the smart suspension, this system lets wheels move independently. This gives drivers a better start on mud, sand or snow. The system uses electronic synchronization to deliver effective torque at low speeds. The Tiguan cabin is definitely upscale considering the base price. Features include the classy metal trim of its instrument panel and the ergonomic gauges on its dash. A leather-wrapped steering wheel is another nice touch. The seats are covered in a woven fabric cloth that is pleasant to the touch and offers a long-lasting quality. Of course, leather is available, too. Like most cars today, the Tiguan has a flat-folding rear seat, but it is also equipped with a fold-flat front passenger's seat. This gives drivers extra room for longer items. The back seat is fairly roomy and offers a fold-down center console. If you can spring for the pricier R Line trim, you’ll love the dashboard tech. Volkswagen has jumped to the head of the class with Car-Net, an in-car Wi-Fi system that lets passengers get online on their portable devices. The Fender Premium Audio system is a definite winner. The rearview camera is easy to see on the 5-inch color display. This touchscreen is a must-have, modern feature. Perhaps the R Line’s best dash feature is push button start. From the start, SUV makers have assumed that size will protect passengers. The Tiguan, on the other hand, goes the extra mile. The Tiguan has special safety features that protect against intrusion. The B-pillars are heat-formed to provide better roof support. Anti-intrusion door beams and crumple zones also keep crashforce out. The entire cabin is encased in a steel-reinforced safety cage. This structure radiates the violence of a crash, diminishing its ability to harm passengers. Pedals fold back during a collision. Even the steering wheel will collapse to protect the driver. More and more automakers are devising after-crash safety devices. Volkswagen has the intelligent crash protection system that is indeed intelligent. To stop fires, it shuts of the fuel pump. To signal for help, it turns on the hazards. To ensure easy exit, it unlocks the doors. If you are a commuter, you will appreciate the trim size of this crossover. It will fit in more urban parking spaces than many competitors. With its performance to complement its size, you won’t have trouble zipping in and out of tight traffic. The Tiguan requires premium fuel, an extra expense for drivers. Then it doesn’t offer good fuel economy: 18 mpg/city and 26 mpg/highway. The price for the Tiguan is low, but most consumers will end up paying extra to get the automatic transmission and better dash tech. To stay small, the Tiguan had to cut corners somewhere, and the place is the cargo hold. It is small considering how roomy the car's passenger area is. The 2014 Volkswagen Tiguan is definitely a driver’s car. Consumers will like its luxury vibe paired with its lower cost. Even with five seats, it may seem a little small for families due to limited cargo space. For singles or couples, this vehicle is likely to feel just right for the road.